Information Technology Leadership: Think Strategic and Act Tactical! Being strategic with technology means treating your IT plans as a living and breathing organism that needs fed and nurtured. There is no auto-pilot, or silver bullet. Technology needs to align with business strategies to achieve optimal results. When the technology strategy supports business goals, the business can be agile, execute its strategies, and seize new opportunities. From an information technology perspective, small organizations tend to be more streamlined and agile than their larger counterparts. In my experience, part of this reason is because they don't have the complex requirements of larger organizations. They can be more efficient by focusing resources on visible projects that directly add business value. They don't have the underlying scale and bandwidth issues that convergence creates, nor the complexity of a large scale distributed security model. I do think we also need to differentiate between those activities that are necessary, and those that do not add value when compared with the true cost of their delivery. I'm a big fan of keeping it simple, except when the added complexity better prepares you to respond to future opportunities. In large organizations, technology is like an iceberg. The part that everyone sees and evaluates is the ten to twenty percent above the water. 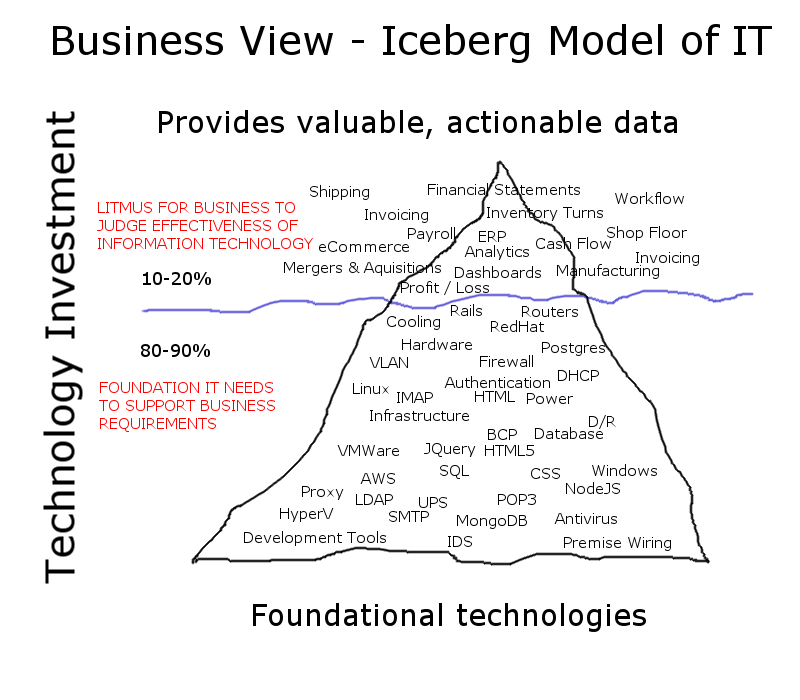 The eighty or ninety percent of the iceberg under the water is necessary to support the technology strategy in a complex, diverse environment. Your actual percentages aren't as important as the analogy. Above the water, we have the user facing outputs. These include outputs that enable the business to deliver its products, and data that supports sound decision making. Your business produces a product or service that adds value, such as knowledge gained through online learning, a cheerful living space supported by large architectural windows, or confidence while working in an underground mine that's protected by a trusted roof support system. What is your contribution to the business? opportunities. The eighty to ninety percent? These are the things that business executives take for granted, or don't know that are needed to support visible services. They want an integrated communications system, and don't need to know that its supported by an SMTP, POP3, or IMAP server. They want secure access to information on the web, without knowing about firewalls, proxies, and virus protection. They want to know how many widgets they sold, and don't care about the database, operating system, network, switches, VLANs, or programming language necessary to deliver actionable information. They want an end product. It's our responsibility to plan for the 80-90% below the surface. We need to act as if we are selling a solution that adds value to our organizations. As experts, we should act like an auto service center, and not like an auto parts store. Companies with a vision know where they want to be in five years, and they are executing steps in a business strategy to prepare them for success. As technology professionals, we need to know that destination and milestones along the way, so we can be prepared to support opportunities as they arise. Businesses cannot wait for us to build the 80-90% below the surface, they can barely wait for the 10-20% above the water. That's where we need to be strategic. Oh, and the difficult part... is convincing businesses that they need to invest in the 80-90% so that we can be agile in delivering the 10-20%. It's like building a house. You may be ready to sleep in your new bed at your soon-to-be-built home. However there is a lot of preparation, planning, and construction necessary to build the foundation, walls, roof, and the rest of the house. All of this needs to be completed before you have a place to put your bed, and get a good night's sleep. I've had many conversations with business executives and leaders over the years, and there's one question I've asked that has solicited many different responses... "Where do you see this company in five years?" Organizations with a well thought strategic plan often asked follow-up questions... such as... are you talking markets, products, or growth? Companies that lack vision often struggled to form a response beyond they want to survive, or want to grow, yet lack any cohesive planning to support their goals. Follow up questions on how IT can support that strategy are often met by vague answers... and questions of why it's important for IT. There is a perception that IT is only the 10-20%, and "can't they just let us know when they need the service?" However, it takes careful planning and execution to build solutions to enable success. I've learned over my career that as leaders, we need to maintain targets to focus and challenge our teams. This is our strategic direction, it's where we believe we need to be at different milestones over five years to support realization of the business plan, with some type of agility. It's much easier to get a good night sleep if I have a place to put the bed, and don't need to wait for someone to dig the foundation. We should be judged on the quality of services we provide, not on heroic efforts that mask a lack of vision and strategic planning. We cannot provide reactionary excuses for why we can't deliver results by tossing grenades over the wall and blaming others. It's our responsibility to ensure that we can support our customers. Milestones form the tactical piece. It's important to provide deliverables, and to keep a pulse on changes that may affect the overall strategy, or business landscape. By acting tactically, and thinking strategically, we can develop digestible projects and milestones that form steps in getting to our final destination. We should get feedback from the business as we deliver interim "services", so we can adjust the strategy to support changes, and adjust our trajectory as appropriate. I do believe in developing multi-phased long-term projects, with periodic planned releases and milestones. Based on the project, we normally establish bi-weekly or monthly working group meetings. I've found if you want to deliver projects that meet the customers' requirements, have your technical team provide frequent updates and get feedback. You'll often discover requirements that may not have been communicated, or interpreted correctly... and can be adjusted before they have any significant impact on your project. In summary, thinking strategically is equivalent to knowing that you need a place to live, and planning each phase of construction. Acting tactically is the business of construction. It's delivering milestones like excavation, masonry, framing, plumbing, electrical, roofing, and finishing work. If you find that you're building on a slate outcropping, you can adjust. If the weather delays framing, there is also an opportunity to revise your plan. You can add resources, sub-contract, outsource, or decide that the delay is acceptable. It's all about understanding that plans should be living organisms that evolve with business requirements. There isn't a one-size fits all solution, and different organizations have different requirements based on size, geography, organization culture, economics, market, product, and other factors. Plans shouldn't be put in a drawer and revisited once a year. Remember, think strategically... and act tactically!